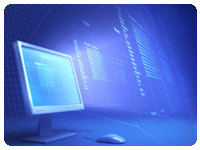 (leading to ExpertRating Wireless Networking Certification). About the ExpertRating Online Wireless Networking Course instructor :David Iseminger is a computer and networking expert and an experienced teacher of networking topics. As a student first and expert second, Iseminger knows which teaching approaches are most effective. Iseminger has worked at Microsoft Corporation as a telecommunications specialist, networking performance analyst, and lead programming writer for cutting-edge network disciplines, including emerging wireless technologies. Iseminger has published 12 computer books with various publishers, including John Wiley & Sons, Macmillan, Microsoft Press, and one ...for Dummies book. His formal education is from the University of Washington where he earned degrees in English and Comparative Literature with a minor in writing. Iseminger earned his MCSE certification in under a month. Online Wireless Networking Course requirements: For taking this instructor led ExpertRating Online Wireless Networking Course you need ICompletion of David Iseminger's Introduction to Networking online course (or equivalent experience), Internet access, e-mail, and the Microsoft Internet Explorer or Mozilla Firefox Web browser. "Enjoyed the course very much. I believe this will help me greatly when I set up my own home wireless network." "Great class! Although I have worked with wireless equipment, it was nice to have some of the "background" information to go along with what I've taught myself. I would definitely recommend this class and the instructor to others." "I enjoyed the class very much. It was very informative and will help me in my job. The lessons were well written and easy to understand. Thank you!!" "I enjoyed this class. Very informative and right to the point. Found it technical but tought making it very easy to understand. The test right to the point not a reading test as was my other class. I think you learn more when you don't have to worry about reading into every word..to confusing. Loved this class!" "I enjoyed this course. The material was well presented. I plan to sign up for anything that David Iseminger teaches." "I just completed 2 courses by this instructor. Excellent presentation of material, particularly the analogies used to explain the material." "I like this instructor very much and have made a point of checking a course to see if he is teaching." "I really appreciate the depth of knowledge, writing style, and use of graphics by this instructor. By far the best online teacher I've had and I'll be taking his other classes and have urged others to sign up for this one." "Thanks for a good class, I have learned a lot, and feel a whole lot better about the security of my home network." "The instructor's writing style and use of examples were very clear. They presented a practical and familiar environment that crystallized the concepts and made them real and understandable. Past courses (from another provider) dealt in theory and were muddy and vague - they could have used this instructor's methodology and communication skills. Well Done!" "This course has enabled me to get a wireless access hotspot created for the library. (It is up and running.) My boss says I am brilliant. I could not have done it without this course. You are great. Many thanks." "This was the third course I had taken with this instructor, all of them have been excellent and extremely interesting." "Using this course, I was able to connect my hand-held PC to my Wi-Fi home network! I had tried in the past and failed. Great hands on instruction." "Wonderful course!! I learned all I expected and much more!" ExpertRating is one of the world's only ISO 9001:2015 Certified companies (from TUV America) offering an Online Wireless Networking Course (leading to ExpertRating Wireless Networking Skills Certification). When you choose the ExpertRating Online Wireless Networking Course you can be sure that you are buying a premium International certification that is recognized by hundreds of employers and Government bodies in the US and other countries. With ExpertRating you get certified quickly online and you are equipped with a store house of information through the in-depth ExpertRating Online Wireless Networking Courseware which has been developed by experienced Networking and Security Industry Experts. The ExpertRating Wireless Networking Certification is by far the best value for money instructor led Wireless Networking Program at $129.99. How much does the Wireless Networking Certification cost and what does it include? You can buy this ExpertRating Online Wireless Networking Course leading to Wireless Networking certification at a special offer price of only $129.99 which includes the in-depth ExpertRating Online Wireless Networking Courseware and exam fee. This is the best value for money Wireless Networking Program available till date. You get the following services within the USD $129.99 fee. 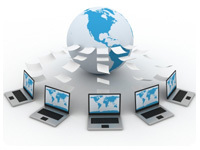 In-depth ExpertRating Online Wireless Networking Courseware including scenarios and case studies. World wide airmail delivery of the hard copy Wireless Networking Certificate. 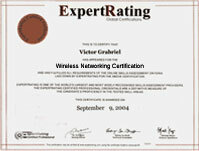 The Wireless Networking Certificate can be used to prove your certified status and does not mention the words "online". The process of getting yourself certified is very simple. All you have to do is buy the ExpertRating Online Wireless Networking Course for $129.99. Log in to the instructor led course using your password. Go through the ExpertRating Online Wireless Networking Courseware (which would take you 6 weeks) and complete the final Wireless Networking Certification exam at your convenience. 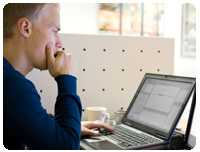 You can complete the exam within 2 months of buying the Wireless Networking Certification. The result of the exam appears as soon as it is completed, and your Wireless Networking Certificate is mailed immediately. Chapter assignments to help you practically use the Wireless Networking that you will learn during the Wireless Networking Course. The final exam is fully based upon the ExpertRating Online Wireless Networking Courseware that is provided along with the Wireless Networking Certification. If you have gone through the courseware properly you should not have a problem clearing the exam. The exam consists of multiple choice questions from all chapters of the ExpertRating Online Wireless Networking Courseware. The increased mobility, installation speed and scalability of wireless networks make them score over wired networks. The first Internet connection was made at UCLA in September 1969 with a thick gray cable between two computers. Times sure have changed! Currently the Internet serves millions of e-mails and Web pages every few minutes, connecting millions of users from all over the world. And presently, wireless networking is the hottest networking technology around. People who use wireless networks can check e-mail from their favorite coffee shop, surf the Internet from their couch, and even get instant messages on their Internet-connected cellular phone. Learning how all those wireless networks operate is as interesting as the Internet itself. In this first lesson, you'll learn about basic network facts and operation, preparing you to expand your knowledge in subsequent lessons. Did you ever wonder how your radio turns invisible waves into music? Or have you wondered why you can hear bass sounds from farther away than cymbals? Why does a radio station cut out when you go through a mountain tunnel or around a bend? Wireless networks have similar characteristics to radio music transmissions, but there are important differences. This lesson will explain how wireless networking actually works in simple everyday terms that make it easy to understand. You'll also learn about different methods used to pull computer data out of thin air. Why do some electronic devices gain widespread popularity while others sit on the shelf? In this lesson, you'll learn how standards in the networking world help drive the adoption of technology. You'll also get a firsthand look at how standards operate in every real-world business, like clothes and batteries and shampoo. In doing so, you'll learn why some wireless networking technologies have flourished while others have failed miserably (early wireless technologies were a flop!). By the end of this lesson, you'll know who makes the standards, how something becomes standardized, and why it's so important. And yes, you'll also see how all this applies to wireless networking standards and gain insight on why wireless networking is so popular now-a-days. If you've considered buying wireless networking equipment, you know that there are lots of choices out there. How do you make sense of it all? Which technology is better? What do all of those extra features mean to you? In this lesson, you'll learn all about wireless network devices, what role each device plays, and how to make sense of it all! By the end of this chapter, you'll know exactly what each wireless networking device is capable of doing and which one is right for you. This lesson will investigate short-range wireless network technologies. You'll learn all about Bluetooth (it has nothing to do with dentistry! ), Wi-Fi, and the details that make each technology unique. This lesson will also take a firsthand look at why one is better than the other and where each technology fits into the larger wireless networking picture. Would you consider a wireless networking technology capable of traveling 90,000 miles a long-range wireless technology? You certainly would! In this lesson, you'll learn which wireless technology can go beyond your house, beyond your neighborhood, and even beyond the atmosphere. You'll also learn the drawbacks of having your data travel into space and back, and about some long-range wireless technologies that might give DSL or cable Internet access a run for their long-range money. Now that you've learned all about wireless technologies, it's time to put your knowledge to work. In this lesson, you'll learn how to plan a wireless network. After all, once you learn about wireless networking, you'll want to get wireless working in your house or office! This lesson will walk you through each planning phase, complete with network drawings that depict how a real-life wireless network should be prepared. In the previous lesson, you planned a network. In this lesson, you'll install a wireless access point (WAP) to get the wireless network up and running. 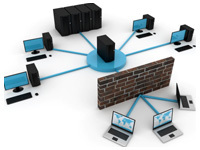 You'll also learn about issues you should address when configuring a wireless network, including interference with neighboring networks and how to extend your network to reach far-off corners of your home or office. Once you have a wireless network ready for computers to access, you're ready for the next step: connecting wireless devices. In this lesson, you'll learn how to outfit a computer with a wireless network card, how to connect that computer to your wireless network, and how to make sure that wireless network connection is properly configured. By the end of this lesson, you'll be ready to surf the Internet from your couch! Then this lesson will look at the similarities and differences between Windows and Apple software. Computers aren't the only devices capable of connecting to wireless networks these days. There are all sorts of wireless devices, like Personal Data Assistants (PDAs), that you can connect. In this lesson, you'll learn how to hook those other devices into the wireless network you created in previous lessons. Then you'll get a chance to explore how Bluetooth networks operate, how they differ from Wi-Fi, and how to go about connecting one Bluetooth device to another. You can't take the security of your computer (or network) for granted these days. In this lesson, you'll discover how wireless networks provide security for wireless devices that connect to them. You'll also learn how to make your own wireless network secure, ensuring that only the people you want to connect to your wireless network are capable of doing so. You'll also learn how to secure your wireless device, such as a computer or PDA, when you're roaming all those cool (but potentially unsafe) public access areas like coffee shops or downtown wireless districts. What is the future of wireless networking? Are you there? Is this as cool as it's going to get or are you going to see all sorts of new wireless technologies in the future? In this lesson the instructor will give you its thoughts on where the future of wireless networking is headed and what that future might have in store. This lesson will discuss the future of cellular networks, the future of answering the telephone on the Internet, and how power lines and broadband might be a match made in heaven! Of course, the future is open, but it's fun to make some educated guesses based on history and how networking technology has moved in the past. Be prepared to add you own thoughts to the discussion on the future of networking—this will be an especially interesting and exciting lesson!